If you want to use other ad networks (non-AdSense ads) with our ad system, you have to use the div’s provided below and wrap your code before placing it into the ad box. Important: If you are using AdSense you just have to paste your full AdSense code into the theme and manipulate the ad via the size options and enable/disable buttons. You can disable the image ads and Google ads only on specific resolutions. For example, the theme hides the image ads via CSS. 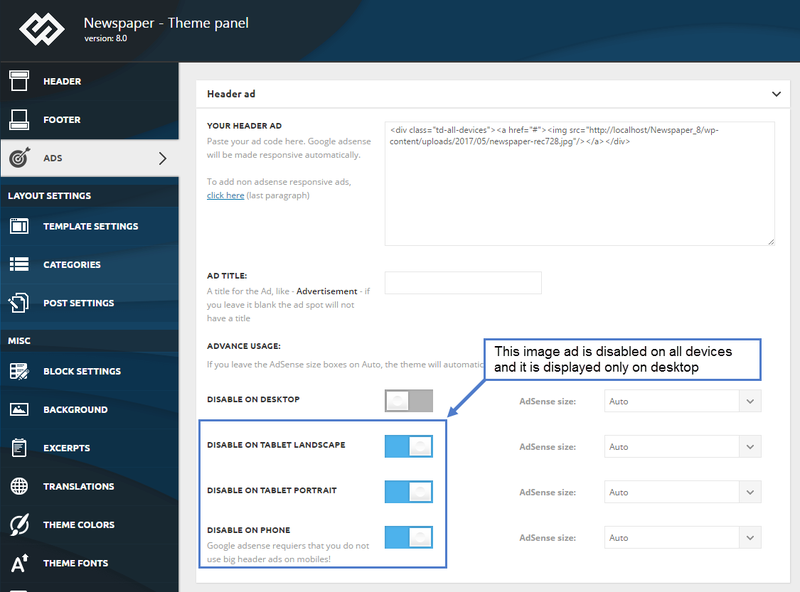 For the Google AdSense, the theme does not render the ad on a specific resolution if it’s disabled. AdSense ad size doesn’t change when you manually resize the browser window, you have to resize and then refresh the page. This is a restriction imposed by Google, the TOS says that we cannot alter the ad in any way once it’s rendered. * do not use this method for AdSense. This is just for custom ads. For AdSense just paste your full code into the box and customize the ad via the on/off switches and the predefined sizes.